Owing to our years of industry experience, we are offering a wide range of Cylinder Valve. 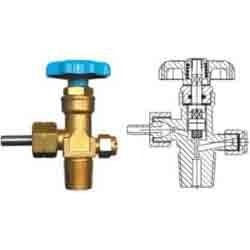 Offered valve is widely appreciated by our clients for its simple installation and corrosion resistance features. This valve is well designed and manufactured using the best grade raw material and modern technology in synchronization with the set industry standards. Furthermore, to avoid any flaws, our quality controllers test this valve against different quality parameters. Established in the year 2009, in Vadodara (Gujarat, India), we “Incryo Systems Pvt. Ltd.” are the leading Manufacturer, Exporter and Supplier of high quality range of Cryogenic Vaporizer, Pressure Building Coil, Cryogenic Pump, Cryogenic Manifold, Industrial Valve, Evacuation And Gas Filling Device, Flash Back Arrestor, Cryogenic Hose, Gas Empty Alert Equipment, Cylinder Trolley, Nitrogen Gas Cylinder and Switching System. The offered range is widely used in several industry like steel, oil & gas, medical, automobile, food & beverages, electronic, pharmaceutical, glass and tyre. At our well-established infrastructural unit, these products are manufactured using high quality raw material and latest technology as per the set industry standards. These products are known for their features like dimensional accuracy, sturdiness, precisely designed, anti corrosive and easy to install. In order to timely meet the large-scale requirements of customers, this infrastructure unit is installed with the advanced tools and machinery. The installed tools and machines are usually updated to attain best quality in the production process. Also, we are also providing services likeAluminum Welder Work, Installation Service, Aluminum Fabrication Work and Nitrogen Purging Service.